Rare Half Dollars with Promise. Coin collectors salivate at the mention of rare half dollars. While in the presence of a numismatist, just casually slip in a phrase like "silver half dollar" or "liberty half dollar". What you may observe next is akin to tossing raw meat to a starving dog! While US half dollars are relatively large and attractive coins, very few of them have achieved consistent value appreciation over long periods of time. We present here half dollar coins that have earned this distinction. Alright, by now you've probably noticed there is only one half dollar listed here. Yes, the headline does say "A Few with Promise", indicating something PLURAL, which is another way of saying more than one. Something we hope you've noticed is for every coin listed in the Bullish US Coins section, there is a feature called "The Year This Coin was Minted..." which ties the highlighted coin to important events that occurred the year the coin was issued. It does take a little special effort to research and prepare listings in this format, and beyond setting up a "placeholder" half dollar (the 1921-D Walking Liberty) we haven't found time to get more bullish half dollars listed. The good news is that this site, US Coin Values Advisor, does provide fact-based buying recommendations on more than just one half dollar. It's just that you have to go to the Rare Coin Values Index or the key date analyses found in every entry of the US Coin Types section. There, you will see numerous half dollars (as well as every other face value denomination) having glorious long term value trends, with similar expectations for the future. The only drawback is that you won't get the same in depth history lessons you'll find in the Bullish US Coins section. The 1921-D has the lowest mintage of all the Walking Liberty Half Dollars. Only 208,000 pieces were minted. A favorite target of collectors, the 1921-D has consistently advanced in value over a period of many years, easily weathering boom-gone-bust bullion cycles. Purchase specimens in the best condition you can afford, but don't get down on yourself if you have to "settle" for a 1921-D Walker on the lower end of the grade spectrum; you have in your hands a classic rarity that will someday be worth substantially more than what you paid for it. The last few years demonstrate you must be prepared to hold onto it for the long term. In 1921, the Reparation Commission of Paris set Germany's liability for its role in causing World War I at $33 billion, leading to the collapse of the the German mark. The result was hyperinflation and a wrecked economy, engendering a feeling of bitterness among the German people. An outspoken critic of reparation payments, a young man named Adolf Hitler, begins to attract many followers. On June 1, a massive racial riot erupted in Tulsa, Oklahoma. The melee broke out when mobs demanded the lynching of a black man accused of assaulting a white female elevator operator. As many as 300 people were believed killed. The New York Giants defeated the New York Yankees in the 1921 "Subway Series", by a margin of five games to three. For the first time ever, baseball games were broadcast over the radio. In West Virginia, more than 2000 federal troops staved off an attack by thousands of angry union coal miners against non-unionized labor. Violence claimed dozens of lives during this period of labor strife. Former US president William Howard Taft was named as Chief Justice of the Supreme Court in 1921. Taft served in this capacity until Feb 3, 1930, only 35 days prior to his death. Knee length outfits were the rave of fashion conscious women during the 1920s. 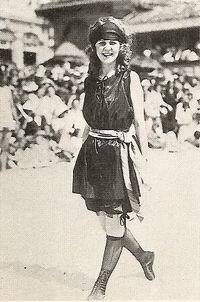 Miss America 1921, Margaret Gorman, displays the style. 1921 was the first year for the Miss America pageant. Coin Photos courtesy of Ira & Larry Goldberg Coins & Collectibles, Inc., Beverly Hills, CA. Image courtesy Library of Congress.